Love Beets, the creators of ready-to-eat beets, will celebrate National Heart Health Month with their “Love Your Heart-BEET” campaign during the month of February. The campaign will span both in-store efforts and digital activations across the Love Beets social platforms with the goal of educating consumers that beets are a great addition to a heart-healthy diet. The brand will partner with Kroger stores nationwide to perform in-store demonstrations and distribute Love Beets samples to customers. The company said that With every sample, each customer will also receive a recipe booklet with several beet-inspired recipes that have been certified heart-healthy by the American Heart Association. 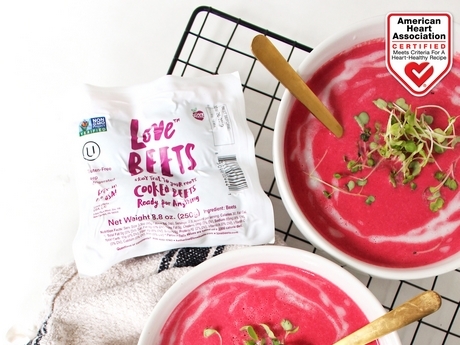 “We’re so excited because having these recipes certified by the American Heart Association only adds to the integrity of our campaign,” said Natasha Lichty, Brand and Marketing Director at Love Beets, USA, LLC. “Promoting and inspiring a healthy lifestyle is a key part of our mission at Love Beets and we’ve made sure that these recipes are very approachable to show consumers that creating healthy meals doesn’t have to be complicated or too time-consuming,” said Lichty. The recipes include a beet-citrus smoothie, a simple beet and feta salad, beet energy bites, beet hummus crudité platter, a golden beet salad, and a roasted cauliflower beet soup. The company shared that all of the recipes have ten or less simple ingredients, with the idea to make them easy for consumers to replicate at home. The recipes will also be available on Love Beets’ website. 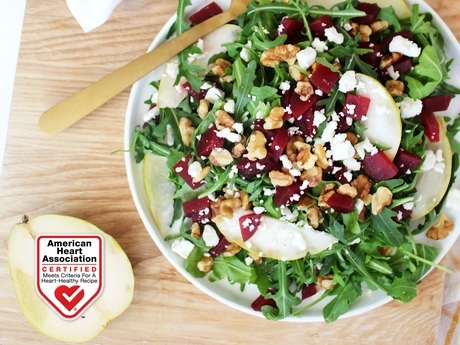 Additionally, Love Beets announced it will be partnering with Registered Dieticians on their social platforms throughout the campaign to post more heart-healthy recipes and tips, and to help explain why beets are a great heart-healthy food. “Beets are considered a good source of fiber, with nearly 4 grams per cup. Fiber helps to lower cholesterol to protect the heart,” said Sammi Haber Brondo, MS, RD, CDN. Haber also explained that beets contain helpful compounds such as antioxidants and phytochemicals. Specifically, carotenoids and flavonoids in beets help to protect cells against damage from free radicals, reduce inflammation, and decrease risk of heart disease. “One cup of beets also contains about 10% of the Recommended Daily Allowance (RDA) for potassium. Potassium flushes out sodium in the body to lower blood pressure and helps reduce the risk of heart disease,” said Haber Brondo. The Registered Dieticians Love Beets will be partnering with during the campaign include @CaitsPlate, @VeggiesandChocolate, @EmilyKyleNutrition, @Bites by Mia, @DaisyBeet, and @DishingoutHealth. Love Beets is encouraging consumers to use the hashtag #loveyourheartbeet to post and find beet-inspired, heart-healthy recipes on their Instagram page. 2019-03-19 "China's next onion production season is about to begin"